Offering the ultimate in style and comfort these 2 seater bench cushions provide the finishing touch to your garden and feature removable covers to facilitate washing. Smaller benches already have the opportunity to look cosier, so add these two seater bench cushions to offer a real sense of style and luxury. 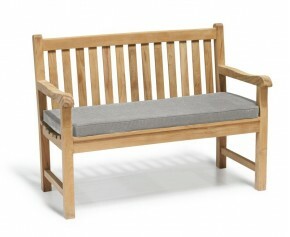 Choose from our 4ft garden bench cushions here. Turn your garden bench into a more luxurious prospect with this 4ft outdoor bench cushion. Expertly woven in polyester for long-life and aesthetic appeal this park 4ft outdoor bench cushion has been finished with high quality double piping edges and a zip fastening mechanism to remove and clean the cushion cover.